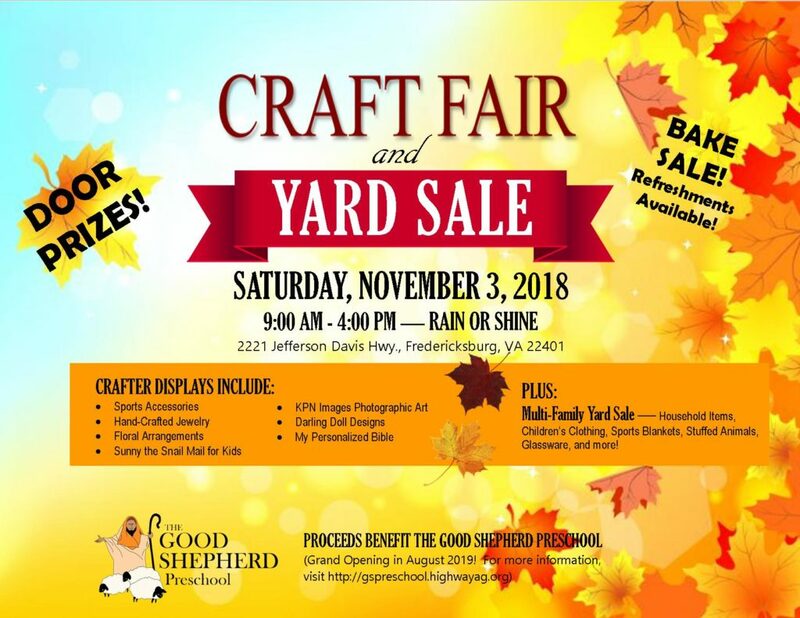 Check out the Craft Fair and Yard Sale hosted by Highway Assembly of God on Saturday, Nov. 3, from 9 a.m. to 4 p.m. – rain or shine in the church’s gymnasium. A wide variety of crafters and vendors will offer original items for sale – from handmade jewelry to sports accessories to dolls to floral arrangements to personalized Bibles to Sunny the Snail Mail for Kids. In addition, a multi-family yard sale will offer children’s clothing, sports blankets, stuffed animals and toys, ornaments and glassware, and other household items. Win a door prize! If you get hungry while shopping, food will be available for purchase. Proceeds from the event will benefit The Good Shepherd Preschool scheduled to open in 2019. Highway Assembly of God is located at 2221 Jefferson Davis Hwy., Fredericksburg, VA 22401, on Rt. 1 at Confederate Ridge.